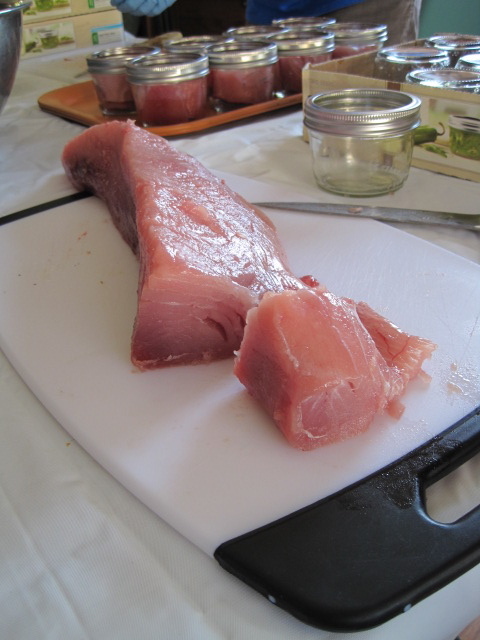 This is a guide for canning troll-caught albacore tuna using a raw-pack method in a pressure canner. It has been reviewed by a veteran, my fellow Master Food Preserver and an excellent teacher, Dale Dow, who has opened her home and taught annual tuna classes to willing new MFP volunteers for many years. I can’t replace Dale’s careful in-person instruction, but I’ve done tuna with her three years running, and tried to take notes on all the tips she provided this year so I can approximate her procedures. All mistakes and lack of clarity are mine, of course. Thank you for this and everything else I’ve learned from you, Dale! Note: Interested in canning salmon instead of tuna? More tips here. Is albacore the best tuna? In Oregon, we think so. It’s one of only two tuna varieties that are certified green-light sustainable by the Monterey Bay Aquarium. Also, since the tuna are caught very young, they don’t have any issues with mercury buildup. And they make the best tuna you’ve ever had. You haven’t TASTED tuna until you have a jar of homemade albacore. 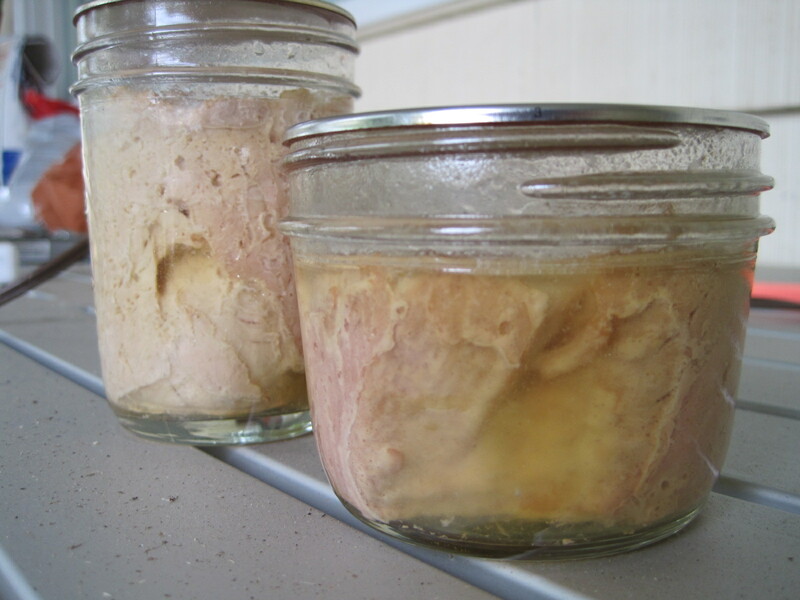 Tuna is a low acid food, and must be canned in a pressure canner (the ones with a clamp down lid that has a gauge or a weighted top), not a waterbath canner (the ones that look like a big stockpot). 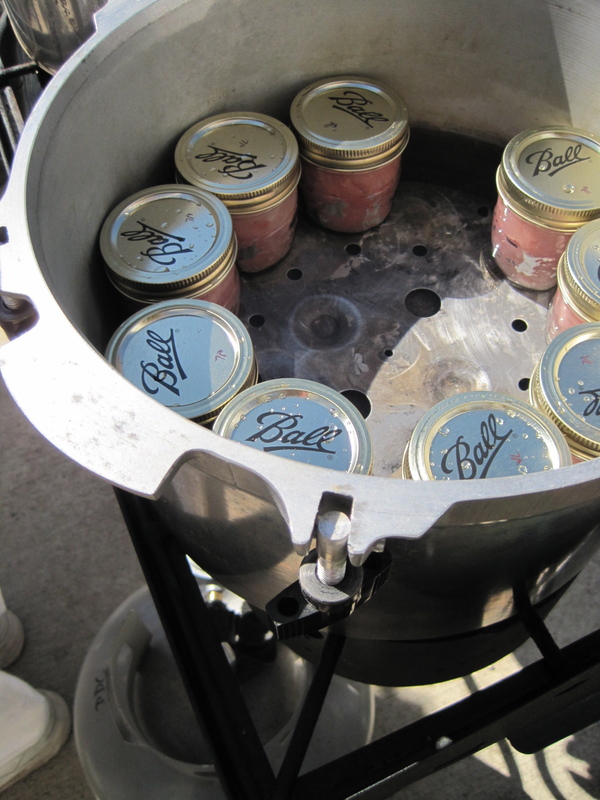 The process takes the better part of a day, and you’re much better off canning tuna outside on a sturdy camp stove, as it smells strongly and the smell lasts on your hands and other surfaces. Trust me, you don’t want this smell in your kitchen. I’m assuming you know how to use a pressure canner, have chosen top-quality and properly stored albacore tuna, and you have cleaned your canning jars, rings, and new lids. If you are using a pressure canner for the first time or need a refresher, this publication from the National Center for Home Food Preservation at the University of Georgia is a good guide. OSU Extension has a publication, developed by a consortium of three Pacific Northwest universities, called “Canning Seafood.” It covers canning seafood in general, including fish and shellfish. I’m using this document as a base for this annotated guide. You can download a .pdf file (PNW 194) by following the links here. Please refer to this document if you have questions about safety, storage, or spoilage. This link also provides pamphlets on filleting your own tuna and on mercury and radiation in Oregon albacore (quick answer: don’t worry; it’s not an issue). Your local fish monger is a good place to bulk-order freshly caught Oregon albacore tuna, cleaned, bled, and prepared as long, single-piece loins. We use Newman’s and Fisherman’s Market in Eugene. There are also places along the coast where you can buy tuna off the boat. Best to talk to someone with experience before undertaking this effort. I strongly advise you not to stray far from these instructions. You’ll be processing tuna for 100 minutes, and if you have to start over or if a jar breaks or otherwise fails to seal, you’ll be unhappy. 1. Check your jars carefully for chips and cracks. I always use new jars for tuna to minimize risk. After washing your jars, screw the rings on and keep them on as you are fitting tuna in the jars. This will make it easier to wash the muck off the jar mouth before canning. Don’t end up like this. Make things easier on yourself: use widemouth jars! Wide-mouthed half-pint jars. 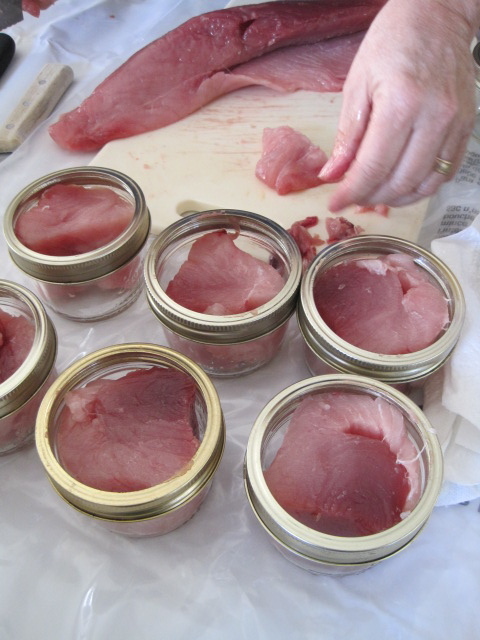 You can use regular-mouth jelly jars, but a tuna loin is a bit fatter than a regular jar (see disaster above), and it requires more cutting. You may also can in wide-mouthed pints, but half-pints are similar in weight to a standard can of tuna — think of how much tuna you’ll need per use. A very sharp, non-serrated, chef’s or boning knife. A non-porous cutting board, preferably one that can go in the dishwasher. Food-safe disposable gloves (optional — note: your hands will smell afterward). A large bowl to hold the tuna loins and a smaller bowl for viscera and scraps. A cat to eat the scraps. Tuna loins (as pictured above). A fishmonger can clean, scale, and cut the fish for you. Plan on a bit less than one pound of raw tuna per half-pint jar. Keep tuna on ice as you’re preparing it for the jars. Disposable ice packs which will smell strongly of tuna once you are finished. A Two-burner or otherwise powerful, sturdy camp stove for every two canners. 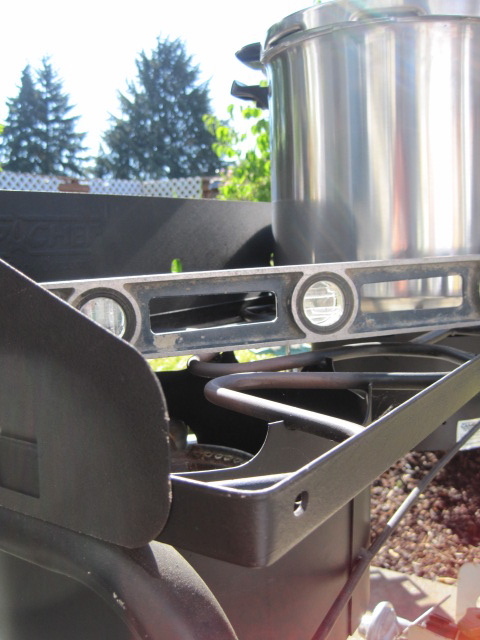 The turkey fryer one-burner stove units run too hot, and may damage a pressure canner. Single-burner tabletop units are not strong enough. 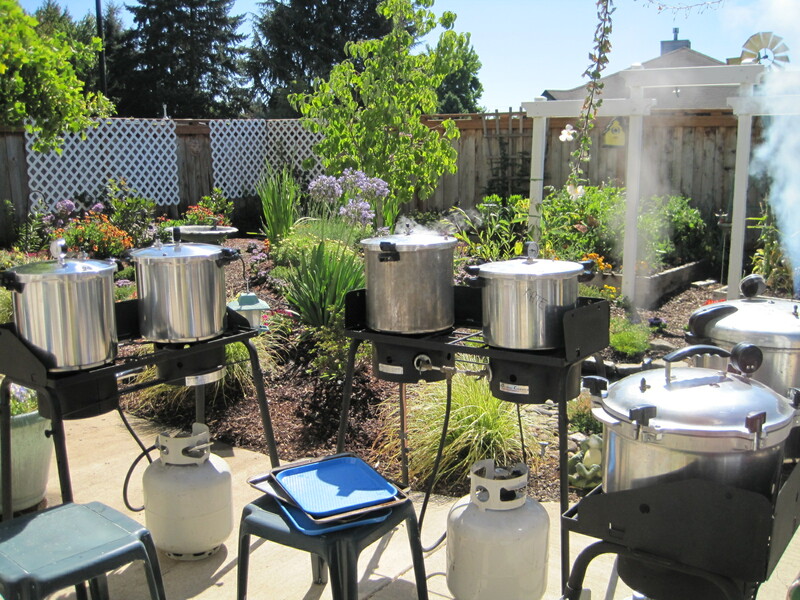 This is the set-up we used at a recent tuna canning party. We put up 154 half-pints of 129 pounds of tuna. You can see the range of canners — two brand new 23-quart Prestos on the camp stove to the left, and a range of sizes and brands elsewhere. The canner closest to the camera on the right is a screw-down lid All-American, a heavier and more expensive canner that does not need a lid gasket. 3. When you set up your camp stove, check the surface with a level to make sure it does not tilt and provides a stable, flat surface. 4. Wash your jars and rings, and screw the rings on to the jars. 5. Prepare your lids. Older lids (unused boxes from years past, for example) may need to be boiled — read the instruction on the box. New lids are generally not boiled, but again, check on the box. They are usually prepared by bringing them up to 180 degrees in a pot of water. This is less than boiling — you can see tiny bubbles form on the bottom of the pot. Once up to 180, let sit at that temperature or slightly cooler for 5-10 minutes to soften the gum on the underside of the lids. If your brand new box does not provide instructions, follow the 180-degree plan. You’ll see that we marked the lids with our names and the date. Names are important in a big canning party! 6. I hope you have a garbage disposal and a double sink, which are ideal for this project. [Edited 2018: I’ve now done tuna without a garbage disposal, and even though I thought I was being careful, the muck blocked my drainpipe and it was a pain to clear it out. I now have smaller hole sink drain filters, but strongly recommend a disposal.] Fill your non-disposal sink with hot soapy water. 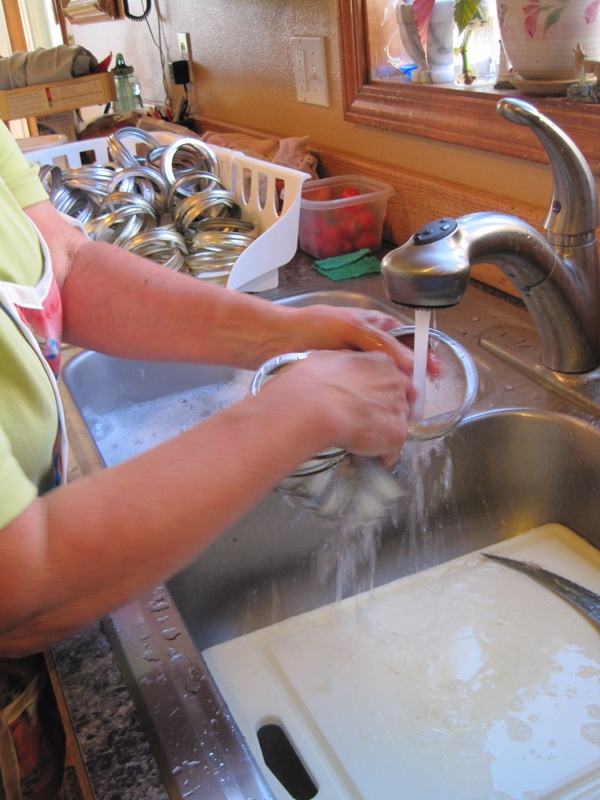 Use your disposal sink to rinse tuna bits off things like knives and cutting boards and hands. 7. 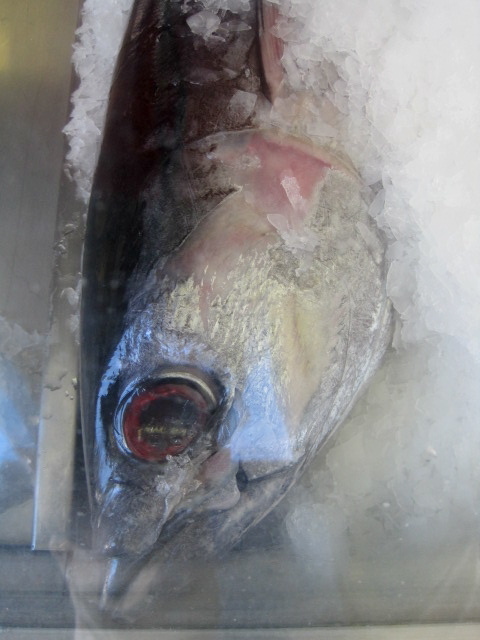 Remove the small dark areas, larger veins, and other viscera, which make the product taste more fishy. I remove the stringy white connective tissue as much as possible for aesthetic reasons, but it doesn’t need to be removed. 8. Fill the tuna jars, as below, to no greater than one inch from the top of the jar. You may be able to get one large piece of loin in with only a bit of excess tuna to fill the crevices, or you may use smaller pieces of tuna. It’s better to be slightly under one inch than over. It’s important to fill all the crevices to the bottom of the jar, so pack the fish in tightly. It will meld together during cooking to create one piece. Try to keep the jars as clean as possible. 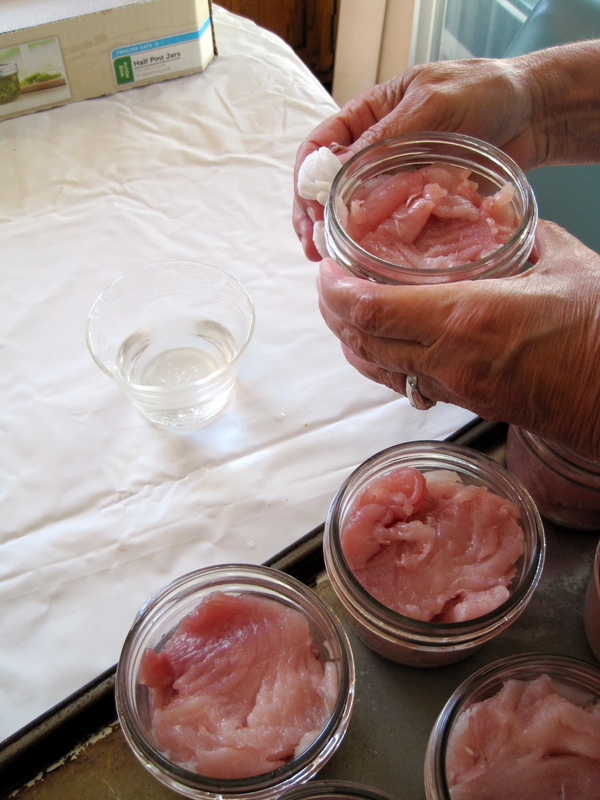 Our teacher uses only one hand for handling tuna, and keeps the other hand clean for handling the jars. 10. Once your jars are all filled, remove the rings, rinse them in the disposal side of the sink, and then wash them in the hot, soapy water in the other sink. Rinse them off and set aside. 11. Pour some vinegar into a small bowl, and soak a paper towel in the vinegar. Use the paper towel to carefully wipe off the jar mouth, especially the top that will have contact with the lid. You want to remove any fish bits or oil, which will inhibit proper sealing. 12. 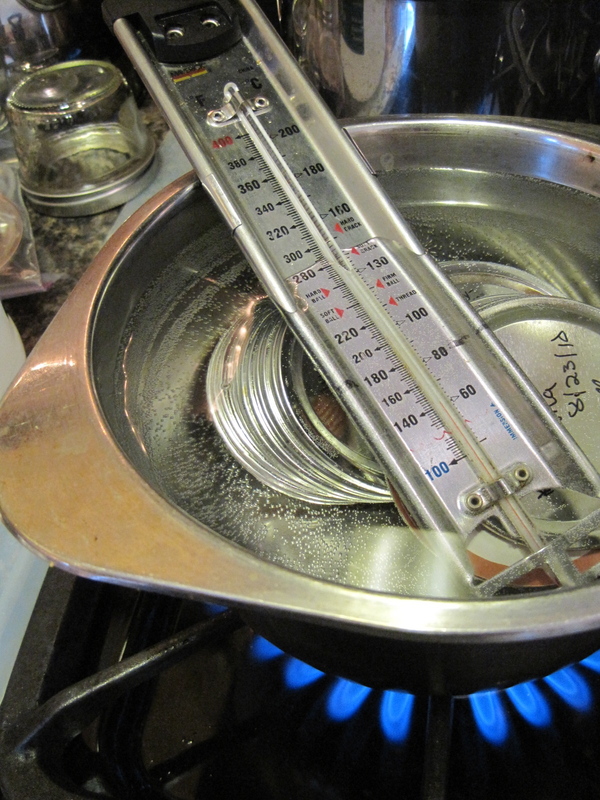 Remove your heated lids from the hot water with a magnetic wand, and place them on the clean jars. Screw on the rings finger-tight (i.e., tighten them until they are just closed but not screwed on as hard as possible). Once you’ve filled and capped your jars, you’re ready to can. 13. Prepare a sheet with the following information. Identify the canner (see the example below, Anne’s canner), then places to mark the time for Vent Start, Vent End, Pressure Start, and Pressure End. We also marked down the number of jars in the canner so we could figure out the price per jar at the end of the session. 14. Add four or five quarts of hot water (about 140 degrees — either use very hot tap water or heat the water in the canner) to each canner. This is much more than usual, because you want to adjust for the longer processing time. You might also add 1/2 cup of lemon juice to the water — this is supposed to help reduce tuna smell in the canner. 15. Place the jars in the canner in layers, separated by canning racks. If you use wide-mouth AND regular-mouth, be careful that the racks are balanced. 16. Start the pressurizing process! Refer to your canner’s user manual, or the Georgia pressure canner link under “Resources” for instructions. Be sure that you are familiar with your local altitude — you will need a heavier weight if you are higher than 1,000 feet. If you are at 1,000 feet or lower: Vent 10 minutes, then place 10-lb. weight (or watch the dial until it reaches 11 lbs.) and wait until proper pressure is reached before timing for 100 minutes. Use your little chart to mark down the times for starting and finishing the vent, then starting the timing at pressure (which could take anywhere from 2-10 minutes). 17. 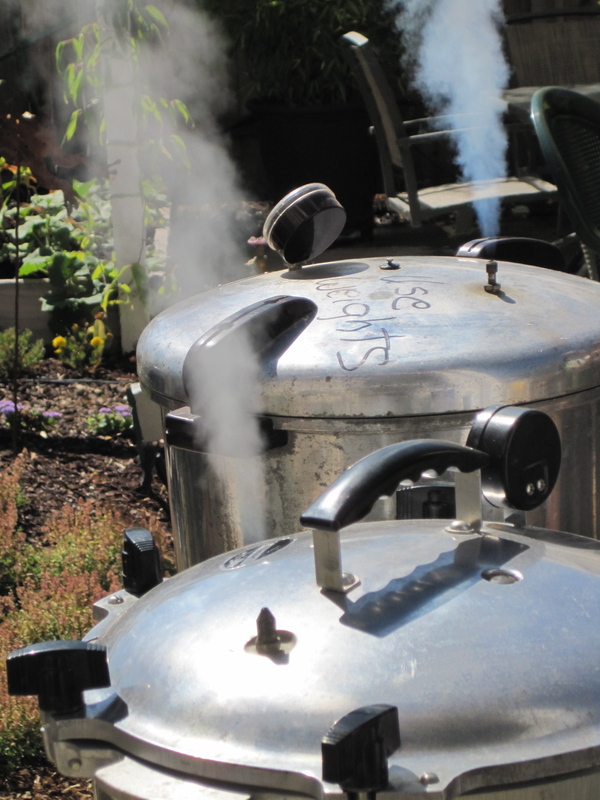 These canners are at the venting stage. Once you’ve hit pressure, can the tuna for 100 minutes, again carefully marking down the time. If you are canning outside on camp stoves, be sure to watch for gusts of wind extinguishing the flame under the stove, or the propane canister running out of fuel. If your pressure drops under the appropriate level, you’ll have to start the entire process over. Also watch for too much pressure. The jiggle of your weight (if you’re using one) should be an even, slow hula, not a frantic headbanging rock-n-roll. 18. When the 100 minutes are up, remove from the heat and let the pressure drop naturally. Do not pour cool water over the canner or try to rush the cool-down. The cool-down period is part of the canning time, as determined by the experts. 19. Once you have depressurized and cooled the canner as per the instructions, it is ready to be opened. See your manual or the Georgia guide for tips on opening your canner, because you are at risk for steam burns if you open it too soon or in the wrong position. Remove the tuna jars and let them cool completely. The jars will still be boiling for quite some time after you remove them, so handle carefully. 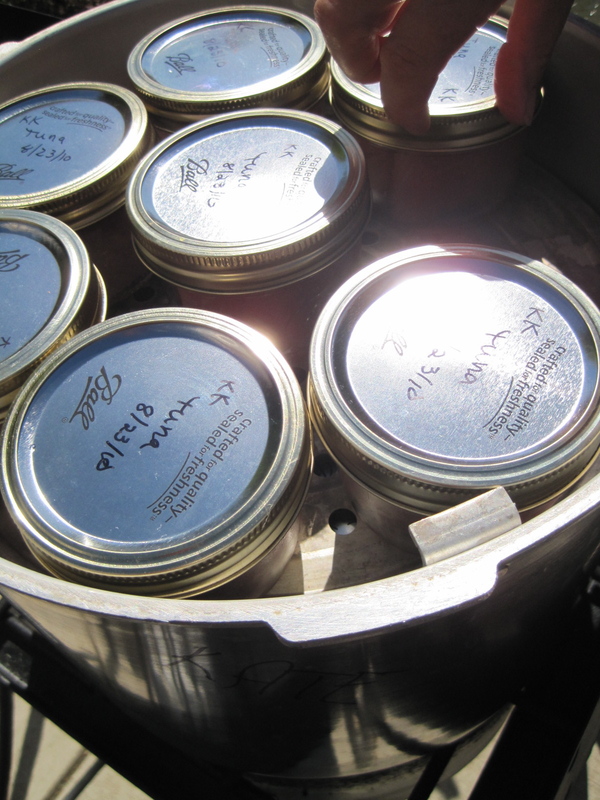 Some of the lids may not have formed a seal in the canner, and this is normal. If they haven’t formed a seal by the time they are cool, you can either refrigerate the jars, or, for longer storage, freeze the jars. There’s no need to transfer the contents into another container, as canning jars are freezer safe. Here are two jars of finished tuna. You can see that I didn’t completely pack in the tuna on the right, resulting in a less attractive product. The juice inside the jar is from the tuna — no water was added. You can also see a slightly darker color for parts of the tuna block. This comes from different parts of the loin. 20. After the jars are cool, you will want to remove the rings for storage. Test each lid to make sure it is firmly sealed, and store any jars that have not sealed in the refrigerator for consumption within a few days. 21. Cutting boards should be put in the dishwasher or sterilized with a bleach solution. You might try Febreze on non-washable surfaces. Good luck. 22. Store the jars in a cool, dark place. They will keep at least until next year, maybe longer. Watch for color changes and lids that pop open. If you suspect you’ve got a spoiled jar, don’t taste the contents before discarding. See the “Canning Seafood” link under “Resources” for more information about spoilage. 23. 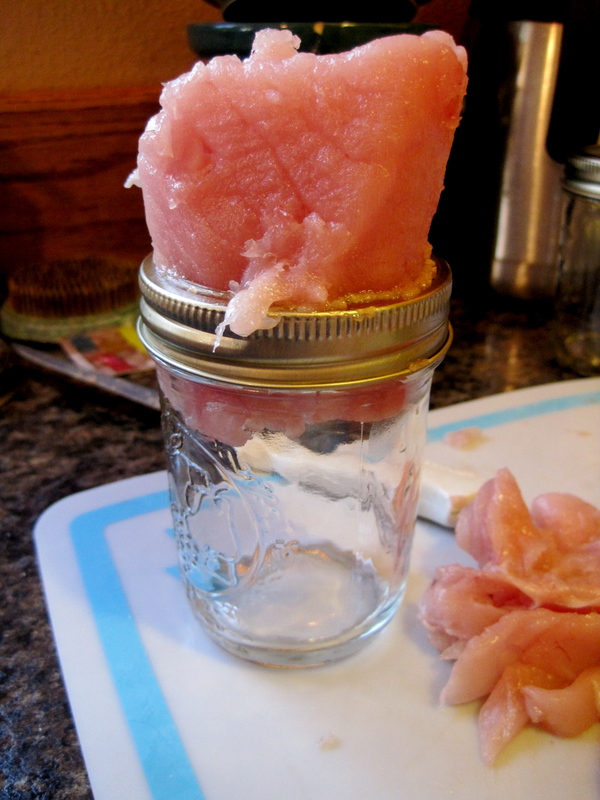 Be sure to clean your canner well after canning tuna. See your instruction manual for the best way to do this. 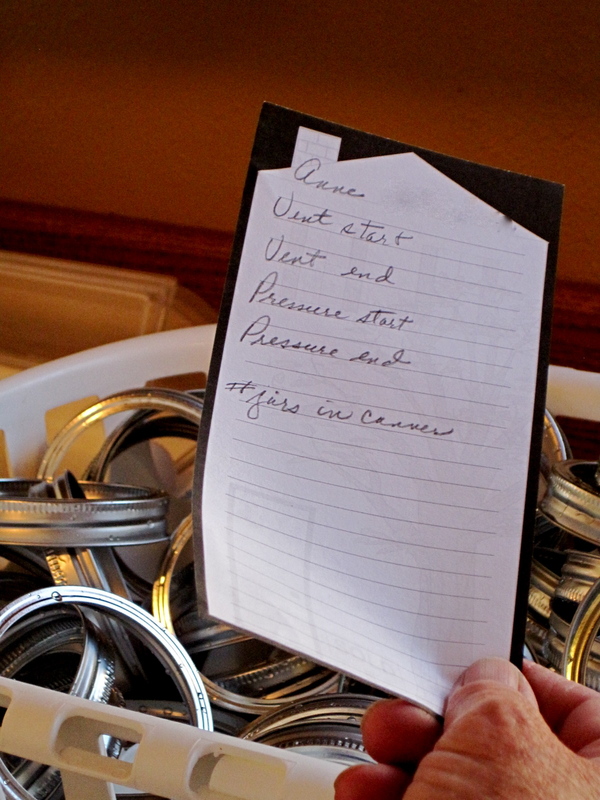 For longer canner storage, fill the cavity with newspapers, which also help absorb smells. Now sit back and enjoy your home-canned tuna. Next Article why i’m steamed: lane county extension, r.i.p. Gary and I expect to extract our delicious honey this weekend. You are welcome to stop by and check out the process — and we’d love to swap some jars of honey for some of that yummy-looking home-canned tuna! Thanks so much for the offer, Ellen! I’m afraid I’m hoarding my tuna this year, though. :) I only put up about half as much as I did last year. 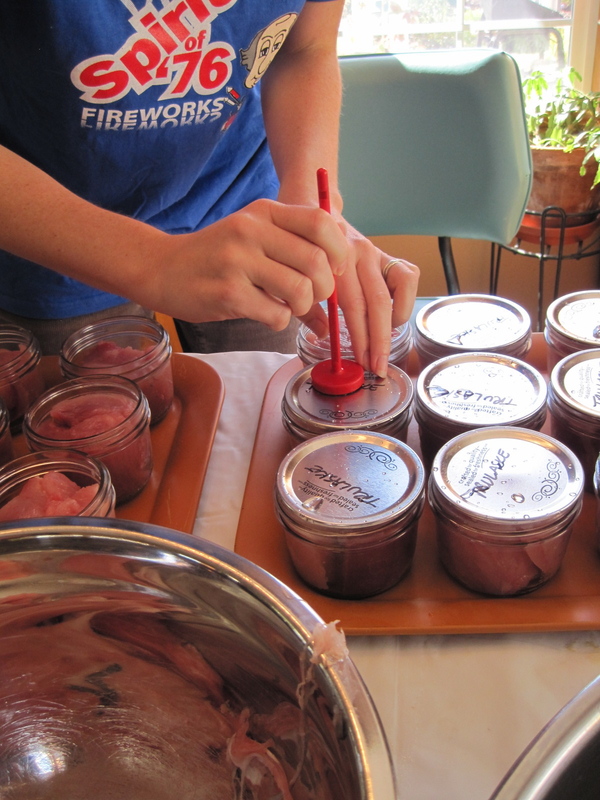 Brilliant post Eugenia – how fun to have a tuna canning party! I especially love the tip on leaving the rings on while stuffing in the fish. Facebooking this now. Thanks, Annette! All my MFP classes were this good. We have an amazing volunteer base. I appreciate you sending the post along to FB. Sounds like this is worth a plane ticket to Eugene. Umhhh, delicious. Thanks for the vinegar tip! Processing a load now. Excited to see the results. Canning a big batch of albacore now. Thanks for the detail and clarity of your post, and all the little tips (leaving lid on, cleaning with vinegar instead of water, lemon juice in the canning water were all new to us). Much appreciated!!! My pleasure! Let me know if I can adjust or clarify the guide in any way. Enjoy that tuna. Great article. I have never canned before going to try canning tuna this weekend. Great article and great detail. Thank you so much for this fantastic post! We live just north of Eugene a bit and are thinking it might be worth it to drive down to use one of the fish mongers you mentioned. Can you give me an idea of what the cost per lb is when buying the tuna from the fish monger vs. buying it at the docks? My pleasure, Don. The cost shifts quite a bit, depending on the season and the quantity. Give Newman’s or Fisherman’s Market a call! For me, the convenience is worth it — it’s already a long day canning so I like having someone else fillet the fish for me and have it waiting on ice. A Eugene reader commenting on my FB page recently priced out fish as follows: “Hanging weight for whole fish at the fish markets is $3.25/lb, $3/lb for 100 pounds or more. Plus $3.50 per fish to skin and debone. Hanging weight at the docks [on the Oregon coast] is around $2.75/lb.” Thank you! Plan on a little under a pound of fish per jar. Has anyone ever used dill added to before you can tuna how much to use? if you get your tuna off the boats and they have them fillet them can i take them home and freeze them for a couple of weeks before I can them? Yes, freezing very fresh tuna wouldn’t be a problem. You might want to go over the fillets once more before freezing and trim away the dark spots and large veins, as they will affect the flavor. Before using to can, defrost. Thank you very much Eugenia ! Eugenia, this is an extremely well done “how to”. Being an MFP, I’ve been canning tuna for ten years. But, every year I like to refresh my brain & you make it easy. Thanks so much. I am getting ready to can about a hundred pounds of Albacore Tuna. I am interested in some of the different flavors that can be added when canning. I have heard that a bit of Jalipeno is excellent! What other flavors are good? I am new to canning and would appreciate any ideas and recipes! Thanks! Thanks, Emily! Good luck, Cliff. That’s a lot for a newbie, but if you stick to the instructions, you should be fine. I hope you have several canners (and helpers!). Be sure to use racks between layers of jars in your canner, and keep it to half-pints, which is plenty (almost a pound of tuna). I like to keep mine plain with just a bit of salt since it leads to more versatility in recipes, but others will add one of the following: a small portion of minced jalapeno or garlic, chile flakes, garlic powder, smoked salt (and flavored salt would be good), lemon pepper, a few drops of liquid smoke, etc. We eat our tuna mostly in tuna salad sandwiches, in a white bean salad with tuna (https://culinariaeugenius.wordpress.com/2009/01/28/italy-at-home-yellow-eye-bean-salad-with-oregon-tuna/ ) or in a nicoise salad. Hi Eugenia, Im getting ready to do a massive amount of Albacore. I have a 23 qt canner and would like to “triple deck” the 1/2 pint jars. (24 total). If this is permissable, do I have to use a rack between EACH layer, of three layers of jars? I have (2) racks now and was wondering if I could put (1) rack on the bottom and the other between the 1st and 2nd layer, and just stagger the jars on top . Will there be any changes in time or pressure for a “triple deck” load? Thanks! Yes, Cliff, you need racks between all layers. Trust me, don’t mess around with the potential of a broken jar. Just run out to the hardware store and pick up another rack. No changes in time and pressure for adding layers. Eugenia, Thanks for the great instructions! We were wondering if you could stack jars in three layers, or only two. It looks like you have them three deep in the picture, but I don’t know if that’s so…. There is an odor during the canning process,but an open kitchen window does the job. The next day you would not even know that we canned in the house. What effect does increased pressure have on the quality of the fish being canned? The Tuna Im canning, calls for 12# of pressure. Ive tried to adjust the heat ,but my canner, for some reason seems to want to hang at the 13 1/2 to 14 pound range. If I can at this pressure will it adversly affect the taste or the texture of the fish? Thanks! Cliff, you should be more concerned about safety than texture. :) The first thing I’d check is the gauge — they should be tested annually, even when new. My brand new Presto was tested at a pound off. Are you in Oregon? We have gauge testing for pressure canners at our local Extension office in Eugene and other locations. Call your local Ext. office to see if you have this service. I recommend buying a “rocker” weight instead of using a gauge, so you don’t have to do the testing each year. If your gauge is accurate, you might be using a too-powerful heat source that can’t be adjusted downward low enough (are you canning on a propane stove outside?). As for texture/taste, pop open a canned jar and taste it! Greg, glad to hear the smell doesn’t bother you! Julia, yes, canning in three layers is OK. Just use racks between them. Howdy Eugenia. I have a new one for you. This is the 2nd time in 30 years that I’ve used my All American Pressure canner (model 921). The last time was about 10 years ago. Both times I had the pressure gauge tested by OSU Ext Service before attempting canning. Why so long in between? Maybe it had to do with a certain frustration that comes of lack of experience with my canner. I never got any pressure following the instructions from OSU. Both you and they instructed me to keep the pressure release valve (petcock) open until pressure reaches 10#. One hundred minutes later with steam still pumping out of the petcock, my pressure gauge stubbornly reads 0 psi (@212-degrees). After puzzling this over with the MFP volunteers, we decided that I should freeze this batch and follow the All American canner instructions instead. Manufacturer’s instructions say to allow the steam to escape for a couple of minutes (2 for jars, 7 for tins) before closing the petcock. Also, rather than putting in 4 quarts of water, just add 3-4″ water to the bottom of the pressure cooker. Lesson: follow manufacturer’s instructions. Do you or your readers have any experience with this? I’m waiting for my jars to cool before starting up the next batch. No, I’ve never experienced that, Keren, and I’m glad you called the MFP hotline. ok it’s official…you’re my new favorite blog. 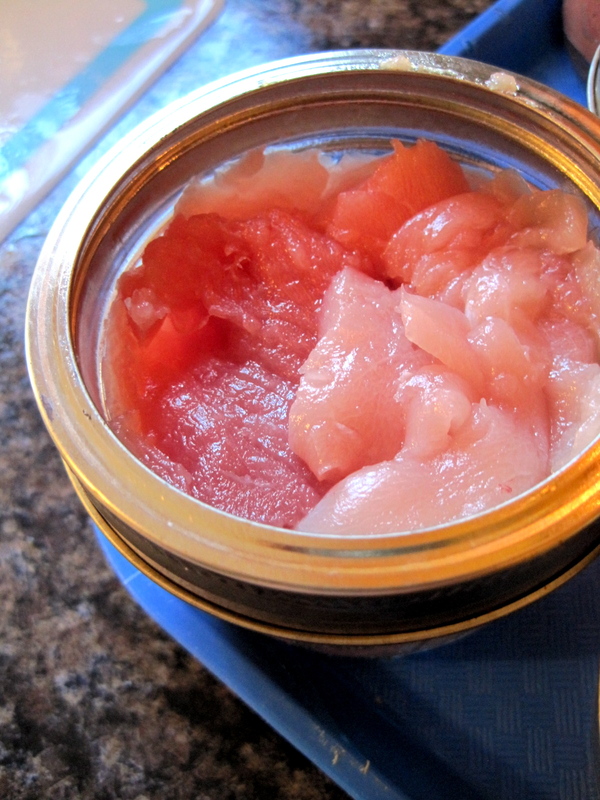 Canning tuna is the highest ambition I have and what made me choose to buy a pressure canner. Can’t wait to do this. I’ve been canning for 2+ years now and I think I’m ready. I’ve done other kinds of meat but never fish. Question: I want to can the tuna in a little olive oil. I don’t mind doing it in it’s own juice but love the way tuna canned in oil tastes so much more. Is home canning tuna in oil ok? Other than watching out for oil on the rim do you think there are any other downsides? I had 7 jars that didn’t seal how long will they last in fridge? freezer? @Elizabeth, sorry I didn’t see this earlier. Store all but one in the freezer, and eat the refrigerated one within a few days. The ones in the freezer should be good for several months, maybe more, until the quality suffers in the way all frozen foods do. I have a 23 qt pressure cooker. I will be triple layer canning 1/2 pint jars of Albacore tuna. How much water should be in the cooker when I start? How far up on the bottom layer of jars should the water reach? Thanks! Hi Cliff, see step #14. We do triple layers of 1/2 pints in a 23-qt. using those amounts. Good luck! I am concerned about our canning last night. 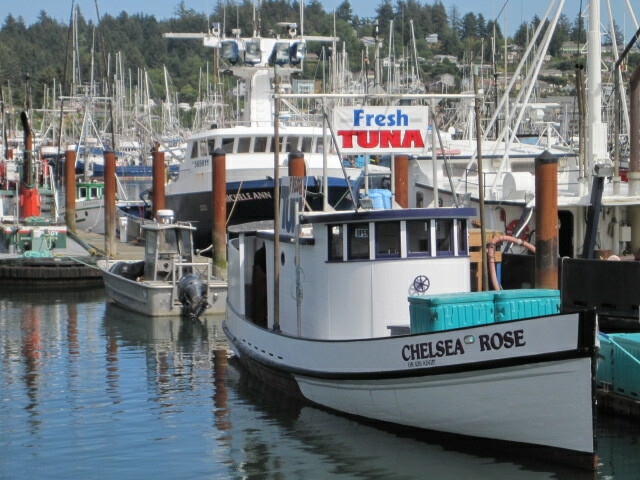 We caught 9 Albacore Sunday and spent all day Monday preparing the tuna and canning. We had about 9 cases and only got to can about 4 cases. the others will be canned in the next few days. My question is that some of the jars have very little juice in them while others have a lot. Should the rings be put on tighter to keep the natural liquid in? or are we cooking to high? any input would be helpful. And if there is no juice in the jars are they still good for a year or so? Thank you so much! The amount of juice doesn’t matter. Rings should always be secured “finger-tight,” which means screw them on so they’re secure, not cranked on tightly. And they might be loose when you take the jars out of the canner. Don’t fiddle with them and try to tighten the rings at that point. They’ll be fine. It sounds like everything is going well! Good luck. @ Keren Levine-This is a little late (I see your post was 2012), but if anyone else has this problem, yes, I have had it where the steam continues to escape and the pressure never goes past 0. The problem is the gasket is old. You will need to replace it and I had to get mine online as I couldn’t find any locally (in Newport) for the type of pressure canner I had. I had a whole canner full of tuna (like I am sure you had) and we ended up borrowing someone else’s canner to recan it. After I got my new gasket, no problem at all. The pressure went up like it was supposed to and kept it at 10#s for 100 min (I maintained the pressure at low heat once it got up there) and the next batch all turned out beautifully. Good luck! Home canned tuna can’t be beat. Thanks, Theresa. Terrific information and it saved me much work. Feel free to comment on my blog any time! Thank you so very much….your instruction and all the questions/replies made canning a enjoyable experience instead off the stressful task it started out to be. @Terresa: Thank you so much! I will try to find a new one pronto. I have an order of tuna to pick up tomorrow. Well … I’ve read all the instructions on your blog and every comment, looking for some advice on my first tuna canning experience. I thought I had it all figured out until I read Terresa’s comment about cooking the tuna BEFORE canning it! Is this necessary? I would think that it might make the tuna less moist. I’m guessing that it is just an option, but why would someone do this? Another point is that we bought our fish from the dock and the fisherman has flash frozen the fish – so it hasn’t been cleaned and I’m guessing that it hasn’t been bled either. Any advice on how to deal with this? We are thinking of taking one of the fish out of the freezer tonight and doing our first trial of canning tomorrow – it’s small, about a 20 lb. fish. Does that seem reasonable for thaw time, if we keep it in a cool room? Any help you can give me about these questions would be greatly appreciated. @ AMH: I have canned tuna a lot, and no you do NOT have to cook the tuna before. I never have. I just pack it in leaving about 3/4 inch headspace with 3/4 tsp salt for each pint and it makes its own juice. The cooking before is what the Ball Blue book (the gospel for canning) if you want oil pack like one of the readers had asked about. I have never done oil pack and my tuna is moist and yummy just in its own juices. For the cleaning, I have cleaned my own before, but have gotten lazy lately and last time went down to one of the places just down by Mo’s annex…..one of the charter boat places and they have fish filet people that do a real nice job for a super reasonable price in my opinion….last year they were just charging $5 a fish, but if you just have a 20# fish look online on how to filet it. I think it will show you there. They come out nicely in 4 quarters and just make sure the dark brown fat is off because it is a little fishy tasting. A sharp filet knife is a must. Most likely they have bled it as this is a common practice when you catch a fish like this. Thanks, Theresa. That sounds promising and very clear! My husband is a pro at filleting fish, so no worries. Thanks for the advice on the dark brown fat. Wish me luck! Hello, I’m new to canning. Bought a new All American canner and did our first batch of raw tuna Monday night. It worked perfectly (using your recipe); 16 wide mouth PINT jars. Last night I did a 2nd batch using 16 1/2 pint wide mouth jars. When I opened the canner, there was a black film on the racks and on the inside of the canner from the water line down? I used 4 qts of hot water at start, which submerged the bottom layer of jars; it this a problem? Black film? Probably tuna residue if your canner is new and the first layer was under the water. I’d wash everything well and not worry about it, personally, but you might try a second opinion by calling your local Extension Master Preserver hotline. In Oregon, that would be listed here: http://extension.oregonstate.edu/lane/food_safety . The black is adhered, cooked on, almost impossible to scrub off. 2 more questions: Do the canners get dark inside over time? When I do my next 1/2 pint load, should I use less water so the jars on the first level are NOT submurged?? thanks! I spotted your blog and was impressed with your detail. I have been canning tuna for over twenty years and do things much the same as you. I have written an article (for an east coast fishing magazine) on my process and would be happy to forward it to you. I like the idea of a canning party – have to try that one!! Share the work and the jars. My husband has recently caught the “tuna-bug” up here in Vancouver, BC and has caught quite a bit of tuna in the past year. Our freezer is full, so I’m learning to can for the first time. My parents have done this before and they always put 1/2 tsp of salt in the cans but I’m concerned this will make the tuna too salty (I use very little salt in my daily cooking). So thank you for your notation about salt not being required, I think I will leave it out and add later if necessary, depending on how I use it. I use spring water or distilled water that I lightly salt to taste and add that to the jars. Works well as I too don’t use salt often when cooking. You never mention filling the jars with water before canning do you fill the jars or not? I have a tuna coming in next week to can. @Cristy, I’m not sure what you mean. I don’t add water to the tuna in the jars since it doesn’t add anything to the flavor and it’s not necessary. Great Blog. I plan to try canning some fall Chinook also. Question/Statement. My 23 quart canner will hold 4 rows of half pint jars (4×8=32Jars) and makes quick work. 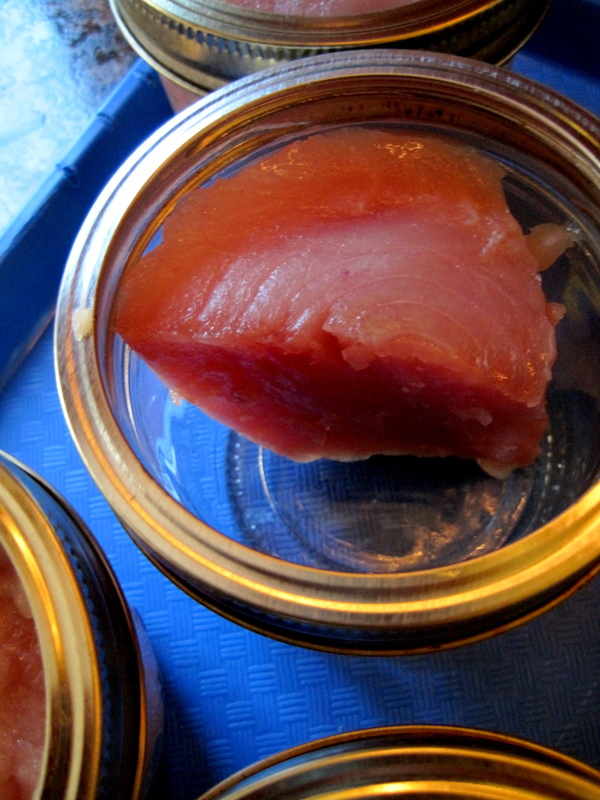 I canned about 20 albacore last year and noticed no problems. Then I actually read the Presto book, which said capacity is 24 half pints. Can you tell me a reason not to pack canner full? @Kenny, nope. As long as it closes and stays at pressure, it’s fine to pack it to the top. Hi Eugenia> We just canned our first tuna and your instructions were invaluable. We had three canners going, and the tuna from one of them has a metallic taste. We did not add salt to any of them – just a bit of water in the jars. Do you know what caused this? And is the tuna ok to eat?